Here is a new featurette from WALT DISNEY PICTURES’ upcoming film MARS NEEDS MOMS . The action adventure is directed by Simon Wells, starring Seth Green, Dan Fogler, Elisabeth Harnois, Mindy Sterling , Kevin Cahoon and Joan Cusack. Here is film clip from WALT DISNEY PICTURES’ upcoming film MARS NEEDS MOMS . The action adventure is directed by Simon Wells, starring Seth Green, Dan Fogler, Elisabeth Harnois, Mindy Sterling , Kevin Cahoon and Joan Cusack. Here is the new trailer from WALT DISNEY PICTURES’ upcoming film MARS NEEDS MOMS . The action adventure is directed by Simon Wells, starring Seth Green, Dan Fogler, Elisabeth Harnois, Mindy Sterling , Kevin Cahoon and Joan Cusack. The greatest love story ever told, starring…garden gnomes? In the upcoming “Gnomeo & Juliet,” Shakespeare’s revered tale gets a comical, off-thewall makeover. Directed by Kelly Asbury (“Shrek 2”) and showcasing both classic and original songs by Elton John, the fi lm features the voices of James McAvoy and Emily Blunt as Gnomeo and Juliet, who have as many obstacles to overcome as their quasi namesakes when they are caught up in a feud between neighbors. But with plastic pink fl amingos and thrilling lawnmower races in the mix, can this young couple fi nd lasting happiness? Take out the trash, eat your broccoli—who needs moms, anyway? Nine-year-old Milo (Seth Green) fi nds out just how much he needs his mom (Joan Cusack) when she’s nabbed by Martians who plan to steal her mom-ness for their own young. Produced by the team behind “Disney’s A Christmas Carol” and “The Polar Express,” “Mars Needs Moms” showcases Milo’s quest to save his mom—a wild adventure in Disney Digital 3D™ and IMAX® 3D that involves stowing away on a spaceship, navigating an elaborate, multi-level planet and taking on the alien nation and their leader (Mindy Sterling). With the help of a tech-savvy, underground earthman named Gribble (Dan Fogler) and a rebel Martian girl called Ki (Elisabeth Harnois), Milo just might fi nd his way back to his mom—in more ways than one. An epic true story set against the backdrop of one of the wildest places on Earth, “African Cats” captures the real-life love, humor and determination of the majestic kings of the savanna. The story features Mara, an endearing lion cub who strives to grow up with her mother’s strength, spirit and wisdom; Sita, a fearless cheetah and single mother of fi ve mischievous newborns; and Fang, a proud leader of the pride who must defend his family from a once banished lion. Disneynature brings “The Lion King” to life on the big screen in this True-Life Adventure directed by Keith Scholey and Alastair Fothergill (“Earth”). An awe-inspiring adventure blending family bonds with the power and cunning of the wild. At “Prom,” every couple has a story and no two are exactly alike. Several intersecting stories unfold at one high school as the big dance approaches; “Prom” portrays the precarious passage from high school to independence as some relationships unravel and others ignite. For Nova Prescott (Aimee Teegarden), it’s a battle of wills as she fi nds herself drawn to the guy (Thomas McDonell) who gets in the way of her perfect prom. Fellow seniors Mei (Yin Chang) and Tyler (De’Vaughn Nixon) harbor secrets, while others face all the insecurity and anticipation that surrounds one of high school’s most seminal events. There are hundreds of nights in high school, but there’s only one “Prom.” Featuring an emerging ensemble cast and a powerful soundtrack. Pirates of the Caribbean: On Stranger Tides Produced by Jerry Bruckheimer and directed by Rob Marshall, “Pirates of the Caribbean: On Stranger Tides” captures the fun, adventure and humor that ignited the hit franchise—this time in Disney Digital 3D™. Johnny Depp returns to his iconic role of Captain Jack Sparrow in an actionpacked tale of truth, betrayal, youth and demise. When Jack crosses paths with a woman from his past (Penelope Cruz), he’s not sure if it’s love—or if she’s a ruthless con artist who’s using him to fi nd the fabled Fountain of Youth. When she forces him aboard the Queen Anne’s Revenge, the ship of the formidable pirate Blackbeard (Ian McShane),Jack fi nds himself on an unexpected adventure in which he doesn’t know who to fear more: Blackbeard or the woman from his past. Star racecar Lightning McQueen (voice of Owen Wilson) and the incomparable tow truck Mater (voice of Larry the Cable Guy) take their friendship to exciting new places in “Cars 2” when they head overseas to compete in the firstever World Grand Prix to determine the world’s fastest car. But the road to the championship is fi lled with plenty of potholes, detours and hilarious surprises when Mater gets caught up in an intriguing adventure of his own: international espionage. Mater fi nds himself torn between assisting Lightning McQueen in the highprofi le race and towing the line in a topsecret mission orchestrated by master British super spy Finn McMissile (voice of Michael Caine) and the stunning spyintraining Holley Shiftwell (voice of Emily Mortimer). Mater’s actionpacked journey leads him on an explosive chase through the streets of Japan and Europe, trailed by his friends and watched by the whole world. The fastpaced fun includes a colorful new allcar cast, complete with menacing villains and international racing competitors. Walt Disney Animation Studios returns to the Hundred Acre Wood with “Winnie the Pooh,” the fi rst big-screen Pooh adventure from Disney animation in more than 35 years. With the charm, wit and whimsy of the original featurettes, this all-new movie reunites audiences with the philosophical “bear of very little brain” and friends Tigger, Rabbit, Piglet, Kanga, Roo— and last, but certainly not least, Eeyore, who has lost his tail. “Well a tail is either there or it isn’t there,” said Pooh. “And yours isn’t… there.” Owl sends the whole gang on a wild quest to save Christopher Robin from an imaginary culprit. It turns out to be a very busy day for a bear who simply set out to fi nd some hunny. Inspired by fi ve stories from A.A. Milne’s books in Disney’s classic, hand-drawn art style. Permission is hereby granted to newspapers and magazines to reproduce these pictures on the condition they are used in connection with direct publicity for the movie in which they appear. All other uses require prior written consent. On vacation in Los Angeles, Walter, the world’s biggest Muppet fan, and his friends Gary (Jason Segel) and Mary (Amy Adams) from Smalltown, USA, discover the nefarious plan of oilman Tex Richman (Chris Cooper) to raze the Muppet Theater and drill for the oil recently discovered beneath the Muppets’ former stomping grounds. 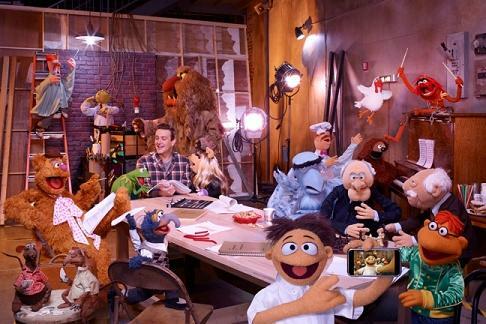 To stage The Greatest Muppet Telethon Ever and raise the $10 million needed to save the theater, Walter, Mary and Gary help Kermit reunite the Muppets, who have all gone their separate ways: Fozzie now performs with a Reno casino tribute band called the Moopets, Miss Piggy is a plus-size fashion editor at Vogue Paris, Animal is in a Santa Barbara clinic for anger management, and Gonzo is a high-powered plumbing magnate. With secret, signature, celebrity cameos. 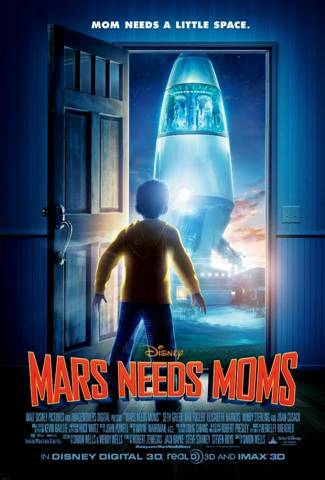 Here is the teaser one-sheet for WALT DISNEY PICTURES’ upcoming film MARS NEEDS MOMS . The action adventure is directed by Simon Wells, starring Seth Green, Dan Fogler, Elisabeth Harnois, Mindy Sterling , Kevin Cahoon and Joan Cusack.